YOU can have it ALL!! Are you looking for that perfect home near Branson and Table Rock Lake? Want to be steps from a pool and playground and have other fun gaming options for the kids – and maybe the adults too? This is it! This beautiful, western-decorated 6 bedroom, 4 bath home has 2 living areas, 2 kayaks, a Wii, pinball machine, pool, arcade game, air hockey and Foosball tables, a shaded deck out back, fire pit with lawn chairs, a fantastic Table Rock Lake view and is about 50 steps from the Branson Canyon pool, playground and clubhouse. Plus our home is just minutes from downtown Branson. Did we mention the public boat launch is only a 1/4 mile away? Bring the boat and have a great time on the lake. A couple of the more adventurous in your party can set out on their own to explore the lake or a nearby creek in our two kayaks while Grandma and Grandpa spend time relaxing and taking in the fantastic views of the lake. We even have parking for your boat in a gated area nearby after your day of fishing or tubing. After your day on the lake or in Branson, come relax by the beautiful Branson Canyon pool or in the clubhouse while the kids burn off that last bit of energy at the playground or splash pad. Then come home to the Lakeview Lodge to lounge in front of the new 42 inch flat screen TV, play on the Wii, or enjoy a game of pool or air hockey in the downstairs living room of your private vacation house. Wrap up your day around the fire pit roasting marshmallows, sharing stories and getting lost in the dancing flames. When the little buckaroos are all tucked in, enjoy the large Jacuzzi tub in the master bedroom to soak those aches away from the afternoon skiing on the lake! After all, we're not as young as we used to be! Or sit out on the porch in a rocking chair in the evening and have some grown up time visiting with Mom and Dad, listening to the crickets, birds, and other wildlife with the cool breeze from the lake in this beautiful country setting. What about those pesky chores like cooking and laundry? Our kitchen is fully supplied with everything you need to cook and eat in house. All linens are provided, and a washer and dryer are available for your use. We've taken care of all the details so you and your family can rest, relax, and recreate! 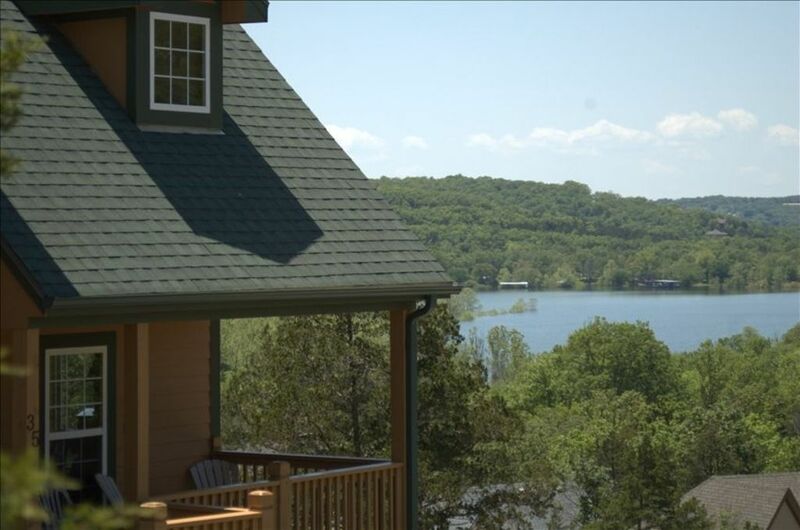 Lakeview Lodge is perfect for making special memories, whether that means relaxing with the family at 'home' or enjoying all the excitement Branson has to offer. TeamRoberts consists of my wife Patty and I plus our four kids. Our three oldest are out of the house and scattered across the globe, from Virginia to Hong Kong, and our youngest is in 10th grade. We love camping and vacationing together - anything that can bring us together as a family. We are excited about helping families create memories that will last a lifetime. We vacationed in the Ozarks for years and liked it so much we moved to Branson in 1996. For years we have been privileged to stay in vacation homes which we much prefer over hotels or condos. In 2011 we had the opportunity to invest in vacation home and we could think of no better place than Branson. With the lake, the family-friendly shows, Silver Dollar City and the beautiful countryside everything about this place calls for families to come aside and enjoy time together. The incredible lake view from the living room or the porch swing out front is an instant de-stresser in today's fast-paced world. Having two separate living areas give a place for the kids to hang out and be rowdy while allowing the adults their own space to visit and catch up with family and friends. Just one house away from the Branson Canyon pool, playground, club house and nature trail make our home perfectly situated. Having two kayaks for your use gives the young people options. Our downstairs game room is outfitted with pool, air hockey, pinball and foosball, meaning you can enjoy clubhouse comforts in your own private vacation home. The BBQ grill and covered front porch provide a great place to relax in the evenings and watch the sun go down over Table Rock Lake. Convenient to all the Branson attractions, yet off the beaten trail. The trees and natural surrounding will refresh you and provide an oasis from the busy rat race of life. Fully stocked, just bring your food! Relax under the trees on our secluded back deck or take in the stunning lake views from our large front porch deck. It was wonderful having a home to come home to after a long day In Branson. We had 12 kids that were 18 years old and they had a blast staying at the house and being within walking distance to the lake. The kids made a lot of memories there. Let me say up front the only negative was no heat in the 3rd floor bedrooms (AC only) -- probably not a problem if the doors are left open, but this was not an option for the family staying upstairs with four small children. A couple of small electric space heaters would fix this issue for winter guests. Other than that, it was a perfect house for our family (9 adults and 4 kids). Nice country setting with a couple of easy hiking trails nearby. Close enough to Branson for quick trips into town, but far enough away to preserve the quiet atmosphere. Plenty of spaces to congregate for games and conversation, or to get away and read a book by yourself. The game room was a hit with the kids, and the grandparents enjoyed playing the "multicade" with PacMan, Centipede, Frogger, Galaga, Donkey-Kong, etc. Be sure to check out all the amenities provided by the owners (porta-crib, high chair, stroller, camp chairs, games, etc.) They even had two crock pots in the pantry. Attention to detail was exceptional, and we loved the plate of chocolate chip cookies awaiting our arrival. This was our 3rd year to stay in this house and okan many more years of family gatherings there. Thanks fir beung so helpful. We had four couples and the house was perfect for us. The guys golfed and the ladies hiked and went site seeing. Good location for all. Very clean and everything worked properly. We went the first weekend in Nov and the trees were beautiful. Highly recommend this property. Our first time to do something like this. Celebrating our 52 Anniv. and a 70 th day. This is one vacation/time away we made precious memories with our family. We would recommend to all our friends to consider this property for their future getaways. Beautiful home and great neighborhood! The Roberts are amazing to rent from and even had cookies waiting for us upon arrival 😋 There was information and brochures about things to do in the area. Our family had such a wonderful time and will rent again in the future! Rates are based on 17 guests; add $15 extra per night per extra guest. Rates are subject to change without notice and are not retroactive. PLEASE NOTE: We NEVER ask for payment via wire transfer. Payment is by check, Money Order, Visa, MasterCard, Discover.